The Asiatic Dayflower really gets around. Native to East and Southeast Asia, it’s spread across Europe and much of North America, where it’s considered an invasive weed. Distribution maps seldom place this plant in Southern California, but it springs up wild here on the edges of neighborhood lawns. It prefers moist disturbed soil, waste places, field edges, ditches and forest edges. I’d noticed it growing in my lawn months before internet research linked it for me with wild edibles. 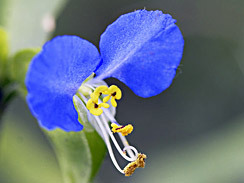 Asiatic Dayflower (Commelina communis) is also called blue dayflower, spiderwort, mouseflower and common dayflower. This plant is used in Chinese and Indian cuisine, and as a medicinal plant. Culinary uses include raw in salads, steamed like spinach, stir fried, or added to soups as a potherb. Stems, flowers, leaves and seeds are all edible. 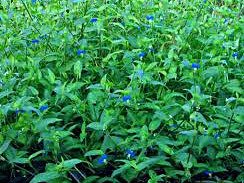 Medicinally, the plant has febrifugal, antipyretic, anti-inflammatory, and diuretic effects, and has been used to treat sore throats and tonsillitis. The flowers were historically used in Japan for blue dye, though it fades to yellow green after prolonged exposure to sunlight. This plant’s main identifier is its smallish flower. Two blue round flower petals are clearly visible, and on closer inspection (use a magnifying glass for a really good look) you’ll find a cluster of three tiny yellow flowers with five petals each, plus long white stamens that remind me Lady Gaga’s eyelashes. Leaf shape and size vary. While most online photos show long pointy leaves, the ones growing in my yard are shorter and nearly heart shaped. I’ve seen both growing in Southern California. After washing, remove leaves and flowers from stems. Prepare leaves by steaming as you would spinach. 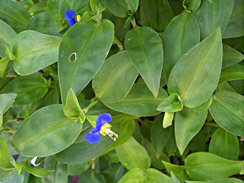 You’ll find that like spinach, aisatic dayflower leaves steam down to about 1/4 volume. Remove to a serving plate and lightly sprinkle with liquid aminos for flavor. Garnish with raw flowers.